Utilizing contemporary tools to analyze historical data provides a unique way to approach historical research, but can prove to be an arduous process as modern tools may not be compatible with historical data. This summer, I have been working with Professor Sarah Purcell to create maps for her book on spectacle funerals of key figures during the U.S. Civil War and Reconstruction. Most commonly, famous bodily remains traveled from city to city on railroads, in some cases on a special funeral train, though they also traveled on rivers and in one case, across the Atlantic Ocean. Nearly every historical figure discussed in the book has an accompanying map which charts their extended funeral processional route. Using GIS technology, we are able to juxtapose census and election data with the geographic routes in highly analytical maps. 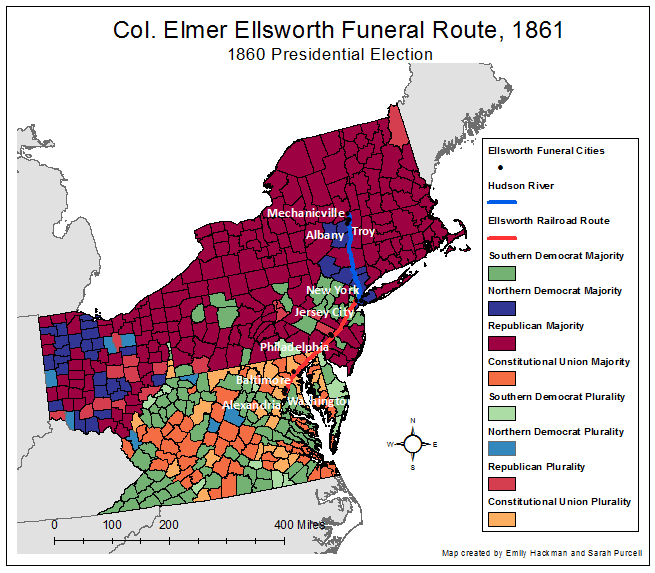 In order to layer election data onto the map for Col. Elmer Ellsworth (died 1861), I gathered county-level election data from the Interuniversity Consortium for Political and Social Research (ICPSR) and county-level census data from the National Historical Geographic Information System (NHGIS). I then needed to combine the ICPSR election data and the NHGIS census data in a joined spreadsheet before importing the data into ArcGIS software to link the data to its county location. At first, I thought we could link the data using something called a “FIPS code.” In an effort to standardize big data and allow for easy joining of tables by location, the Federal Information Processing Standard assigned each county in the United States during the 1990s with a unique five-digit code, more commonly known as a FIPS code. The first two digits are the state FIPS code and the last three are the county code within the state. For example, the FIPS code for Poweshiek County, Iowa is 19157. This code is assigned to the current borders of Poweshiek County. Yet the data I was analyzing is from 1860. Poweshiek County in 2015 represents a different land area than Poweshiek County in 1860. Thus, joining ICPSR and NHGIS data from the 19th century could not be completed using FIPS codes without introducing historical inaccuracy in the maps. In order to join two tables of data in any computer program, there must be a common column between them. From ICPSR, I had a table of county-level election data from 1860 and from NHGIS, I had a table of county-level 1860 census data. If I were to join data tables of current counties, the FIPS code would serve as my common column. However, instead of using FIPS codes to join the data, I created a common column using the name of the county and state. Creating a unique name for each county assures that I correctly joined the historic county data to the historic county borders. Poweshiek County’s unique identifier would be: “PoweshiekIowa.” I quickly discovered that joining data by this concatenated column was not without error. I went through each county individually to discover discrepancies, many of which resulted from spelling inconsistencies between the two databases. After cleaning the data, the tables joined neatly. Using GIS, I then linked the combined election and census dataset to the geographic borders of the counties on the electronic map. I color coded the map by political party. The darker shade of each color show where the political party won the majority of votes in the county (greater than 50%), while the lighter shade of the color shows where the party won a plurality of the votes in the county. As you can see from the map’s multiple colors, unlike modern American politics, the 1860 presidential election involved more than two prominent political parties including Republicans, Northern and Southern Democrats, and the Constitutional Union Party. The political divide between North and South is clearly apparent along the Mason-Dixon Line between Pennsylvania and Maryland foreshadowing the sectional conflict of the American Civil War nearly six months after the election. Mapping historical data is certainly a different process than mapping current data and can prove to be more time-consuming and complex. Though current tools (like FIPS codes) can help standardize mapping techniques, they may not be applicable in historical data settings and current tools may need to be discarded or updated. Historical FIPS codes, anyone?